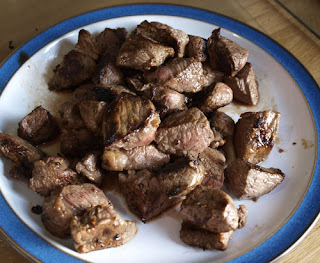 Farmersgirl Kitchen: Beef in Ale - from A Slice of Cherry Pie! It's a funny thing, but through the world of food blogging, you get to know people in a way that would never have been possible in the past. 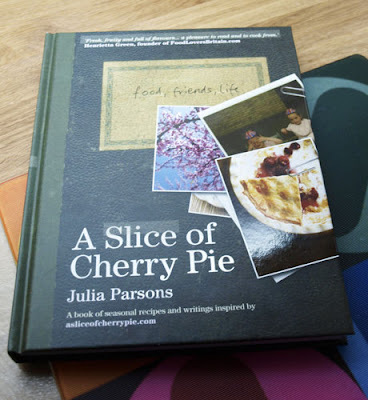 I first 'met' Julia Parsons through the UK Food Bloggers Association Forum and her blog 'A Slice of Cherry Pie', so when she published a recipe book I just had to buy it. 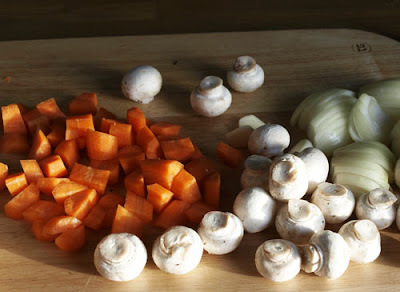 I've had it for a couple of weeks now, but hadn't had a chance to make any of the recipes, so this week I checked out a couple of recipes and shopped accordingly. Now I have to confess that I didn't have any Ale (failed on the shopping accoridingly!) so I used the equivalent quantity of red wine (I always have red wine! ), this would give a different flavour. 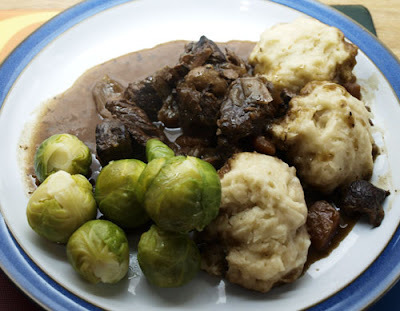 I've used ale in previous stews and it does give a lovely depth of flavour, but the wine worked very well. 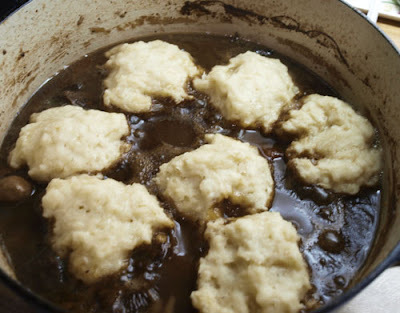 I love dumplings, these were very simple, just self raising flour, suet and salt and they were really lovely and light and fluffy. There was lots of delicious gravy and the meat was very tender after three hours in a low oven. Highly recommended on a winter day. I haven't given you the recipe and quantities as I would recommend that you buy Julia's book. Although I am an experienced cook and know how to make a stew, Julia does provide very full and clear instructions and a good explanation of techniques which also makes it ideal for anyone who is less confident in their cooking skills. I'll be back with more recipes from 'A Slice of Cherry Pie' very soon.